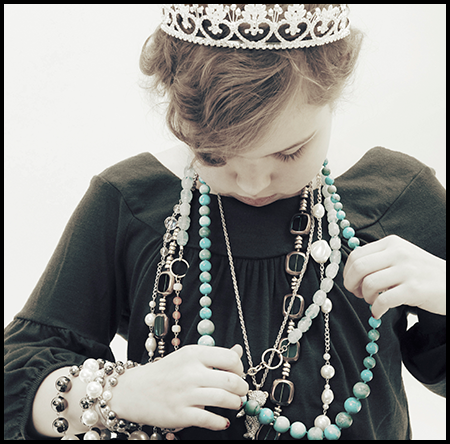 Reader Roxayn submitted a jewelry story, and I loved it so much that I wanted to share it. I always love hearing from readers, so if you have a jewelry story of your own, send it in!! Remember that you get a free book if yours gets selected for the blog. I remember as a young, almost teenager wearing rings, bracelets, necklaces adorned with turquoise. I loved it. And then I didn't. I hid them away in a corner of a jewelry box embarrassed by my passion for turquoise. I switched to all things sparkling and gold. Fast forward a few decades through dozens of glittering earrings, jeweled necklaces, and bangled bracelets. Imagine my distress when I realized my cute, darling daughter's birthstone was not glittery or faceted as her name, Jewel, would suggest. My Jewel had a birthstone of turquoise. It didn't sparkle like her princess tiaras or her glitter splashed tutus. Flat, lumpy turquoise seemed to be such a misfit among the other jeweled celebrations of birth—and totally inadequate to celebrate my Jewel. I said as little as possible about birthstones. I love to make jewelry. I found a necklace I really wanted to make—and Jewel, now a tween, asked if she could make one too. We went on a shopping excursion to find just the right beads. As we gazed at the variety of sparkling, dazzling beads, I wondered how she would choose which pink ones to use. "Momma, don't you just love these?" As I turned to see her selection, shock hit. You can guess what she chose—turquoise beads. "Yes," I said, trying to hide my surprise. "They will look so pretty, and did you know that turquoise is my birthstone?" she asked. I did know. And as we chatted and laughed all through the creative process, I came to know—through her eyes—just how beautiful turquoise can be. She loved it because it was her birthstone, and for me, it became beautiful in her hands.